Below are portions of the census page for Fall Brook in Tioga County, Pennsylvania, showing Brown Judge living as a boarder in the home of Campbell Lowry. His occupation is coal miner, with Ireland as his place of birth as well as that of his mother and father. When I first began researching my great-grandfather and his family, I had also come across another Brown Judge in the 1880 census in New York City. Hmmm. I didn’t give this one much thought, other than the fact that he had the same unusual name. After all, you’re only supposed to be counted once in the census, right? And my Brown Judge was where he should be, in Pennsylvania. One day it dawned on me that the actual date of my Brown’s arrival in America was June 1, and I marveled at the fact that if he had arrived just 1 day later, he would have missed being listed in the 1880 census. Because the next census (1890) was later destroyed in a fire, Brown would not have shown up in any national census until 1900, 20 years after his arrival. I felt lucky to have caught him in 1880! I became more curious about this “other” Brown Judge, so I took a closer look at the 1880 New York census where he appeared. Along the side of the page is the address where the people listed were living. Castle Garden! This was a listing of the people who were at Castle Garden on census day. 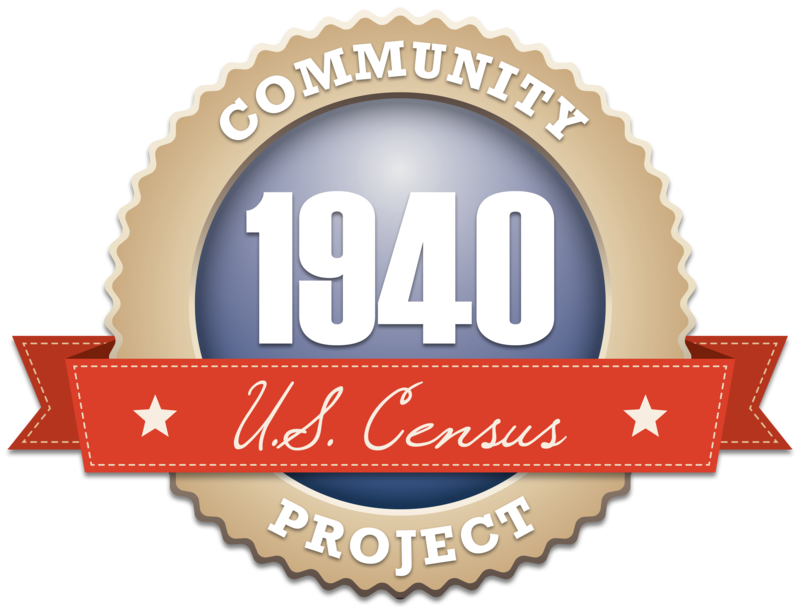 Even though the enumerator did not fill out his census book until June 21, he was required to list all who were there on June 1. 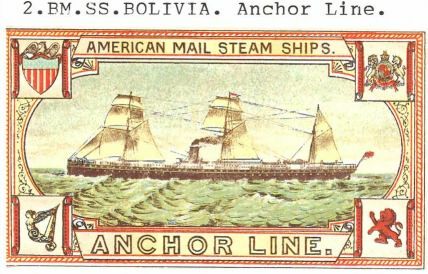 The names listed are in the same order as they appear on the ship’s passenger list of the SS Bolivia—the ship that brought my great-grandfather to America. I am positive this is my Brown Judge, enumerated in New York because he arrived on June 1—the official census day—at Castle Garden. 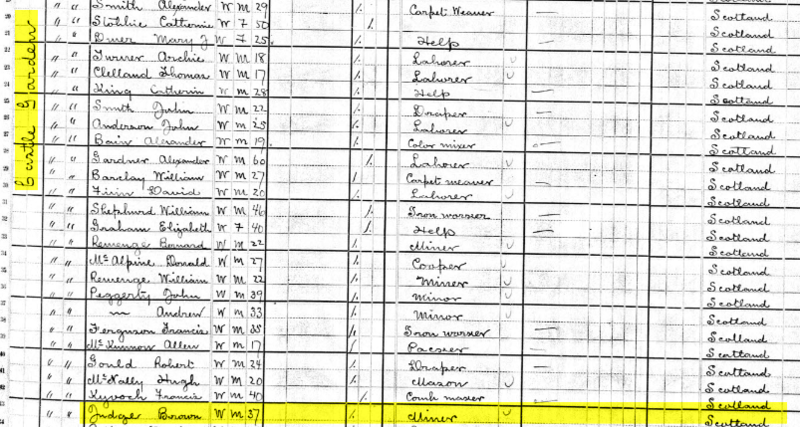 The census taker in Pennsylvania should not have listed Brown Judge in Tioga County, Pennsylvania, on June 1. A person should only be counted once! This was something I had never encountered in my own research, and 15 years have passed from the time I first found Brown in Pennsylvania before I realized that these two Brown Judges were the same person. The one error in the New York census is the fact that Scotland was listed as Brown’s birthplace. He was born in Ireland. That was one of the reasons I had initially dismissed this Brown Judge as my great-grandfather, plus the fact that I already found him in Pennsylvania. Why did the census state that he was born in Scotland? I believe it’s because the ship’s passenger list listed Scotland as “the country to which they severally belong” for all the people on that page. The census enumerator presumed this was their place of birth. While that may be so for many of them, in Brown’s case he traveled from Scotland, and had been living in Scotland, but wasn’t born there. Not only was I fortunate that my great-grandfather arrived on census day, I was doubly fortunate because he was enumerated twice. I didn’t necessarily learn anything new from the New York census entry. But I learned not to dismiss a record just because it doesn’t seem to make sense. Check every record carefully before you decide it’s not relevant to your research! Brown Judge (1842 – 1919), born in Londonderry, Northern Ireland. Died in Tioga County, Pennsylvania.